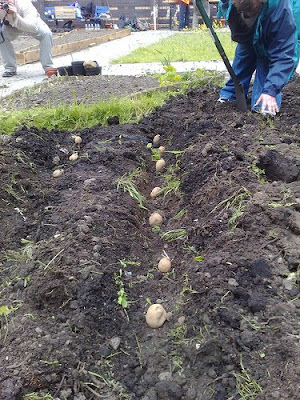 I have had an e-mail from Al at Greener Leith with news of the potato planting in their community garden project known as Persevere Garden in Leith, Edinburgh. Greener Leith took delivery of some free Wiggly Wigglers spuds and you can read all about their potato planting exploits on the Greener Leith site. This post is especially for our friend Mark Eccleston over at The Green Fingered Photographer who asked if I knew of any good elderflower recipes. Shake elderflower heads to ensure they are free of creepy crawlies. Place the water into a large saucepan and bring to the boil. Add the sugar and stir until dissolved. Add the grated rind and sliced lemon, plus the citric acid. Place the elderflower heads in a bowl, pour over the boiling water. Leave for at least 12 hours covered with cling film. Sieve the liquid, to remove the solids. Strain the liquid through muslin or even a coffee filter to clarify. Dilute and add to sparkling or still water. Beat the eggs. Sift together the flour, salt and baking powder. Add the milk, a little at a time and stir in the honey and vanilla essence. When thoroughly mixed, blend in the beaten eggs. Whisk until a medium-stiff batter is obtained. Snip off the stalks from the elderflower heads, but do not separate the individual flowers from the heads. Dip the heads into the batter and fry in hot fat until golden brown. Drain on absorbent kitchen paper, dust with sugar with a dash of cinnamon (optional) and serve with whipped cream. I recently read an article in The Guardian about how supermarkets are failing to reduce packaging. The figures make pretty grim reading. Up to 38% of food packaging cannot be recycled. Amongst the top supermarkets Marks & Spencer are one of the worst offenders with the largest amount of packaging and the least being recyclable at 62%. With concerns growing about ever increasing pressures on precious resources it seems incredible that more companies aren’t reducing packaging or, at the very least, making it recyclable. Here at Wiggly Wigglers we try to keep our packaging to a minimum with the vast majority of it being recycled packaging that can in turn either be re-used or recycled. The latest tool on site is a cardboard shredder so that all the boxes we receive are shredded and used as packing material. We also recycle newspapers, the office paper shreddings and waste from other companies as packing material. I am not saying that we are perfect and we are always looking for ways to improve, but we do try and we will keep trying to be greener. As you probably know we are great fans of the very talented Mark Eccleston (The Green Fingered Photographer) and we are obviously not the only ones. 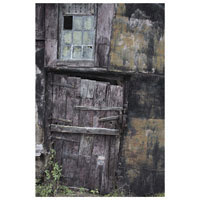 Mark has recently won the 2008 Telford and Wrekin Open Exhibition for his picture called Shed Door. The exhibition provides an opportunity for local artists to display their work and the pieces have been selected for their innovation, creativity and artistic merit. You can view the exhibition at The Gallery Bar @ The Place, Oakengates,Telford from 7 June until 4 July. If you want to hear all about Mark you can find him in Episode 0109 of the Wiggly Wigglers podcast entitled, "A Trip to the Signal Box" which has to be one of my favourites. Welcome to the June 24, 2008 edition of the Wiggly Wigglers carnival of environmental issues. Michel Fortin presents Are All Business People Dishonest? posted at The Michel Fortin Blog. Yannai Kranzler presents Changing the World, One Multinational at a Time posted at Climate of Change, saying, "Thanks! (Please let me know if/when our entry enters the Carnival)"
Phil B. presents Global Warming is Ruining the Earth posted at Phil for Humanity, saying, "A list of how the world has changed so dramatically." Peter Jones presents Indigenous Peoples, Climate Change, and the United Nations: Draft Report of Seventh Session posted at Indigenous Issues Today. Leon Gettler presents Big Oil wins again posted at Sox First, saying, "Hardly surprising but Exxon Mobil's leaders have defeated the descendents of Standard Oil's founder John D Rockefeller. Those descendents wanted Exxon Mobil to improve its corporate governance by splitting the chairman and CEO roles, now held by Rex Tillerson. They also wanted the company to commit to reducing greenhouse gases, and to start embracing alternative energy." Fuel Efficient Driver presents Better Gas Mileage With A Moped posted at I Want Better Gas Mileage, saying, "If high gas prices are really busting your budget �C and youdon't mind standing out from the crowd �C consider buying a moped foryour day-to-day trips." Martinique presents Be green, healthy and rich by giving up on your car posted at Queercents, saying, "I’ve noticed in the past few years that saving money, staying fit, and being green seem to walk hand-in-hand like a three-way relationship that actually works. One of the simplest ways this plays out in my own life is on my bike." Tate Dwinnell presents Algae an Emerging Biofuel - GreenFuel, Solix, Live Fuel, Algenol posted at Green Energy Trends, saying, "Hi, this is a new site of mine focused on green energy trends - thanks for considering the article for inclusion!" Jon Rochetti presents "Scotty…I Need More Power!" The Ultimate Green Graduation Gift. posted at The DC Traveler – Washington DC travel & tourism information, saying, "Here's a review of a couple solar powered back packs, perfect for saving energy." Niharika presents 53 Easy Tips to Use Less Water posted at EcoTrekker. Matt DiChiara presents Green Apartment Construction Hinges on Living Density posted at MyNewPlace Blog, saying, "thanks and have a good weekend!" Louise Manning presents Wind farms posted at The Human Imprint. Tiffany Washko presents Is It Green, Religious, Or Just Smart? posted at Natural Family Living Blog. John presents Red Knots Not Eating Enough posted at A DC Birding Blog. Tiffany Washko presents Freedom Gardens - Grow Your Own Food posted at Natural Family Living Blog. Cindy King presents Can You Learn From International Social Predictions On Rising Gas Prices? posted at Cindy King, saying, "A German Guys Social Prediction On Rising Gas Prices and How They Will Impact America"
Mark Babineaux presents Conservation-stop-thinking-of-yourself posted at Where-is-my-success-i-don't-know-what-to-look-for. Heather Johnson presents Guest Post - Passive Smoke Equals Active Pollution posted at Environmental Crimes Blog. That concludes this edition. Submit your blog article to the next edition of a carnival of environmental issues using our carnival submission form. Past posts and future hosts can be found on our blog carnival index page. Technorati tags: a carnival of environmental issues, blog carnival.